Some examples of our various interests . . .Calligraphy, Quilling (paper filigree), Celtic Art, Photography, Cosmology/Astronomy Links, Music - especially Choral Music - etc!! Click What's New for the changes made recently..
My greatest involvement is in Calligraphy. 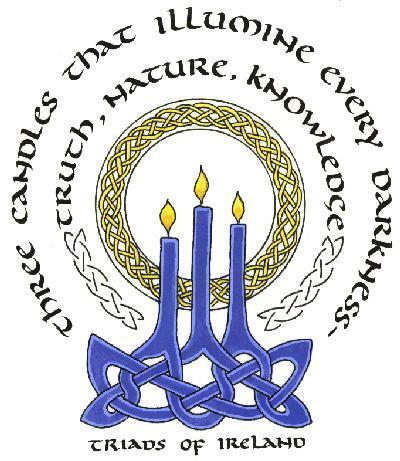 I am a member of the SSI (Society of Scribes and Illuminators) and am editor of the newsletter. I am interested in all things Celtic especially Celtic Art and Knotwork - and Quilling, which is often called Paper Filigree outside the UK!. I play Piano and Flute, and for a good while sang alto in our local Choral Union. Our family holidays always include a compulsory search for Celtic artifacts - which makes it fortunate that we all like visiting Wales, etc. : )) Follow the links on this page to see lots more examples, information on resources etc. An Example of Lesley's knotwork . . . click to see a close-up, then click BACK to return here. Click the link above ("Celtic Art") for lots more examples. You can see still more examples on our Celtic Gallery . Some ancient examples, in stone, can be found on our Welsh page. 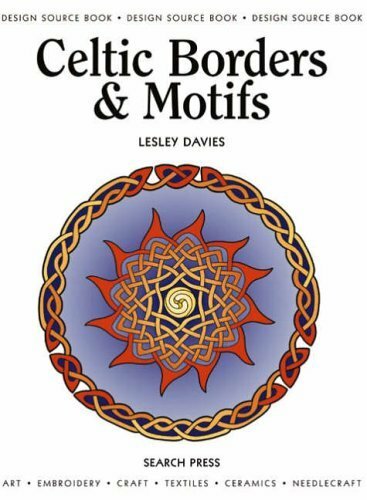 This is my book of Celtic Borders and Motifs: a source book published by Search Press, and available from all (surely...) good bookshops and always from the nice people at Amazon :-) And I'm quite impressed to have an ISBN all of my own! My favourite hand is Uncial, but I also enjoy Italic and Foundational. Follow this link to go straight to more examples, in our newest calligraphy gallery (#2). Quilling is the craft of design in paper coils, made from strips of paper. I have recently completed a four-piece representation of the symbols of the evangelists from the Book Of Kells. 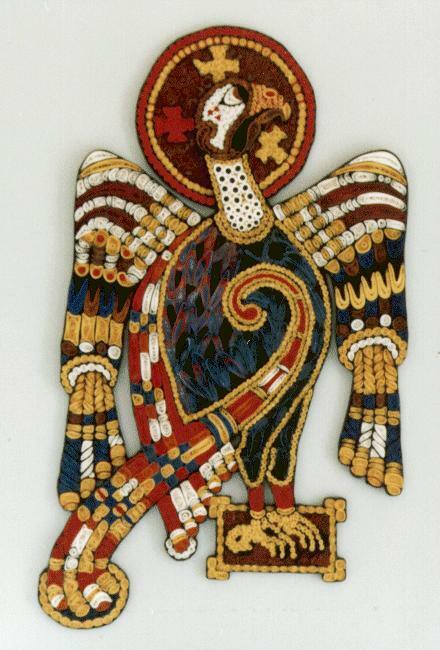 Here is my quilling of the representation of "St John" ; Click it to see a larger picture (colour JPEG, 60K or so - click BACK to return here . . ). Click on the "quilling" link above for more examples, information on the Quilling Guild, and the other 3 symbols of the evangelists . . . I have made a tapestry cushion cover of the Lion (the symbol of St.Matthew), too! Click here to go straight to the first gallery of earlier examples of my quilling.Click here to go straight to the second (new) gallery of earlier examples. A more recent venture is the production of all sorts of handmade books. Lots of examples here . I taught piano - up to ABRSM Grade 6 or so, anyway! - and sing, and play the flute. I am now a retired headteacher, having spent most of my career in an urban/inner-city environment. B is the "anorak" of the family, with an interest in technology - including computing in its various forms.
. . . and in a very amateur way, astronomy. My real interest is the origin and macroscopic structure of the universe. Astronomical objects this side of Andromeda are a bit parochial for me! It is unfortunate then, that the nearest thing of interest is the furthest thing visible to the naked eye (there is a picture on the cosmology-and-links page). My small binoculars help a bit, and the WWW is also helpful! A page of interesting links (useful for newcomers, maybe!) can be found here. They are from the Astronomy and Cosmology sections of my bookmarks file. Having crossed the very thin line between novice ("What's it for, then?") and expert (One who knows something) way back in the 70's, I have been involved in teaching I.T. and managing small-scale systems since about '78 (any more PET initiates out there?). My first experiences were on an ageing D.E.U.C.E. * with 128 bits (yes, bits) of storage - and even that was Mercury delay-line stuff! I'm not actually that old, it was more or less obsolete before we kids were allowed near it! I still remember the "good old days" teaching 80 youngsters with just 1 hour of mainframe contact time per day (no, of course not during the scheduled lessons, silly!) contacted via a Western teletype with a paper tape reader. Perhaps I am that old, after all . . .
* Digital Electronic Universal Computing Engine - classy name, at least! Weren't they all? Ardent camp follower - I am surrounded by the talented and leech experience from their activities. I sang in the same Choral Union as Lesley for some years (I sing 1st bass/baritone) and count the performances I have been in as the Real Thing. I am keen on chamber music and am (still!) working on a collection of all of Prokofiev's recorded works. ...Also included is a collection of my favourite amusing (sic.) quotes and some favourite verses & poems. A recent addition is the picture gallery - a collection of favourite images of things near and ..well, far. VERY far! The idea here is to stimulate the reader into responding with your own personal favourites - the e-mail link is below! Click the links below to go see . . . Finally, there is a full index of links to all the pages on this site: Just click here. To help with the geography, we live near the river Humber: an estuary on the east coast of England. The animated graphics were made with Microsoft GIF animator - free (once upon a time, anyway!) from the MS Web Site! - or taken from the freebies on the excellent ProMotion site. The excellent shareware GIF Construction Set can be used to make animated GIFs, too.